First I’d like to say I hope everyone is having a great Martin Luther King Jr. Day even though really his birthday was last week. He was a really cool guy and I wish I could have known him. This weekend I went to New York City two days! It was kind of crazy and we had to walk a lot! It was really fun though and I really like the city. Trying out for Masterchef Junior was a good experience. And I don’t know if I will get to be on the show but even if I do not get picked I am happy I went and cooked and interviewed. It will be even more fun to watch the show for season 2 now that I know what those kids had to do! 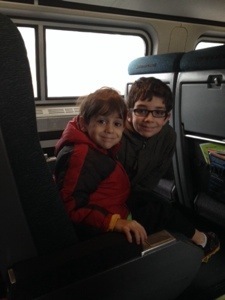 On Saturday my Uncle Greg went with me and my Mom up to NYC (that means New York City) and we took the train. He showed us FAO Schwarz, M&M World and Central Park. We walked through Times Square a couple times. It was sleeting and hailing for part of our walk. We just kept going. On Sunday my brother Finnegan and my stepdad Brian went with my Mom and me to the city. We drove most of the way and then took a train. We used the subway, too. It was confusing. Finn wants to tell you he likes the train and he liked looking at the map. He also said having hot chocolate on the train was his favorite. I think the trip was fun. I hope we get to go back soon. 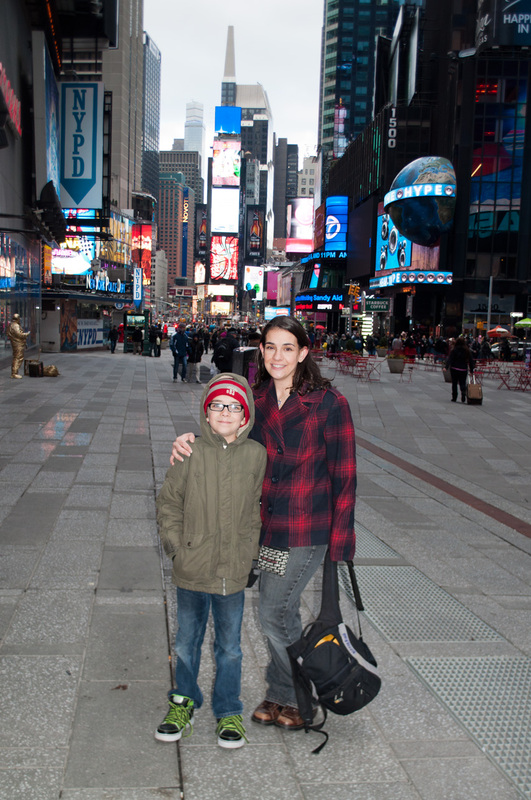 Braeden – I am sure you did a great job – I am glad you and Finn had fun in NYC! Good luck! I like to go to NYC a lot too! My daughter works at Wicked so next time you go up to NYC she and her husband can give you a VIP backstage tour, even if you don’t see the play! NYC is one of my favorite places to visit. You live quit a jam packed fun life with tons of self made opportunities little man! You are a real inspiration! Sounds like you had a wonderful experience in New York, Brae. You have accomplished so many things in your life already, that most people can only dream of. I am very happy for you. You are an amazing boy and make me proud to be your Gram!!! Sounds like a great time in NYC! Please add to your count 7 more 3Bs bags that we had made at our house. Everyone is so appreciative to receive them, Braeden! Aw thank you I’m happy to hear that!